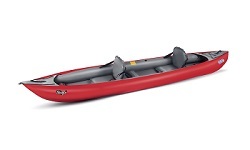 The inflatable canoes and kayaks below are the most popular models in the UK. If the inflatable you want is not listed please contact us and we will be able to supply from within the Canoe-Shops-UK group stock. Constructed from HTP Nitrilon fabrics, which is a lighter version of the fabric used in RIBs Rigid Inflatable Boats used by the RNLI and divers. This is simply the best fabric for inflatable kayak construction and only the military use a heavier fabric. Gumotex therefore make some of the highest quality inflatable kayaks in the world! A lightweight single person inflatable kayak. Great for beach fun and gentle touring on calm inland waters. The Safari has a self draining deck which makes it suitable for paddling on white water rivers and in small surf at the beach. Also great for gentle touring. Comes with thigh straps for additional control. 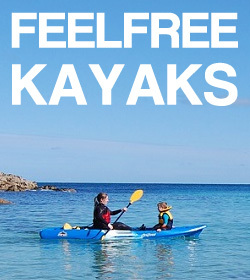 The Gumotex Framura is an inflatable kayak suited to touring inland waters and sheltered coastline in calm conditions. The Framura comes as a 'Set' with spray deck and rudder. 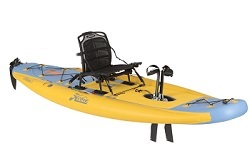 One of the most popular kayaks in the Gumotex range due to its flexibility in seating arrangements. The Solar 2 can be paddled by two or by one. An extra seat can be purchased and fitted to take a child too. Great for all the family for fun at the beach, or gentle touring on calm waters. 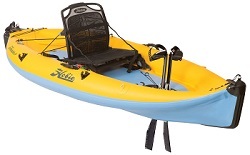 Premium inflatable kayak for 1 or 2 people.  High-pressure drop stitch technology is used to provide a rigid hull design for excellent paddling performance. The most suitable kayak in the Gumotex range for touring on the sea but is also great on inland waters. Versatile seating options for one, two or three paddlers with an optional 3rd seat. Available as a standard spec or as a 'set' which includes an integrated rudder system and removable cockpit covers. Inflatable tandem canoe with high seating. Can be paddled seated or kneeling with the help of included thigh straps. Suitable for touring and rivers up to grade 2 white water. An inflatable canadian style canoe great for family fun, touring and even whitewater! Can carry up to 3 paddlers. Paddle, pedal or sail the Hobie inflatable kayak range with the revolutionary Mirage Drive System. Featuring the super comfortable Vantage seating system. All the fun of a Hobie Mirage Drive kayak that packs away in a convenient storage bag.